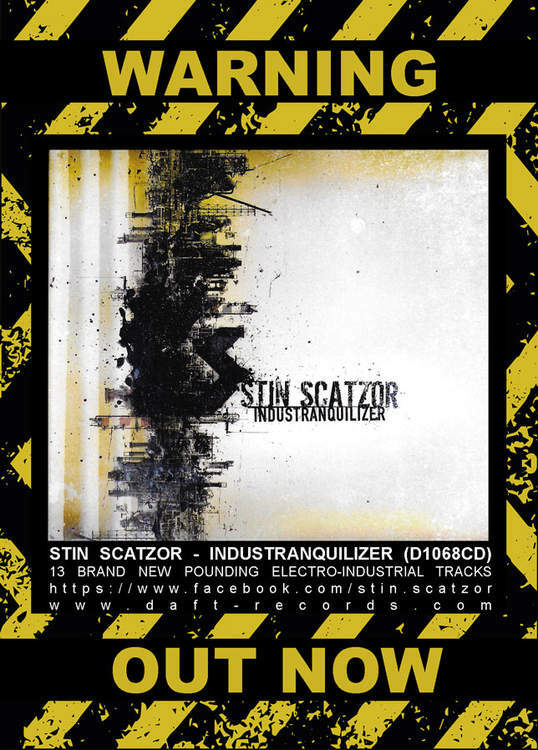 I never could have thought Stin Scatzor would ever release an album on DAFT Records! Hello there gentlemen, finally a new album! If we do not count the Industremakes (2014) and the Industruction EP (2007), it's been a while since you released a full studio album. If I am not mistaken, then the last studio album, Industrogression (2003), was almost 15 years ago. What's to blame for that gap according to you both? Kris Peeters: I think "Industrogression" was more of a try-out, even though there are songs from that album we still perform live. 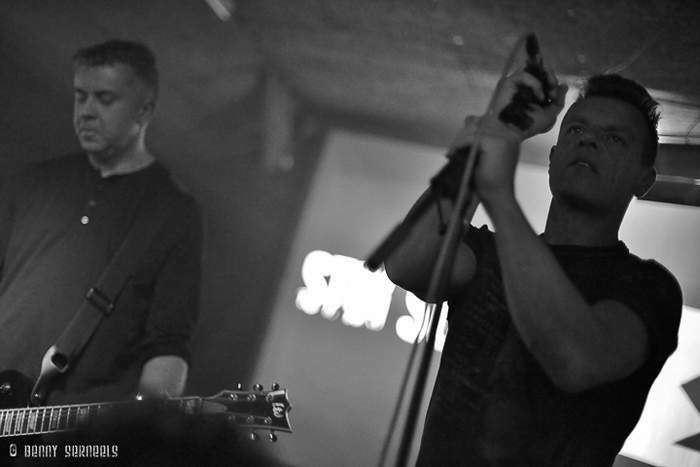 After the first album we made together, we have also tried to find other ways to work on the songs together, maybe that is why. We also made plenty of remixes and remakes for other bands during the period of "Industremakes". Despite the fact that in recent years a lot has happened in my personal life, "Industranquilizer" was produced faster then I could have hoped for. Maybe it was an extra outlet and therefore sounds more intense than the previous releases. You seem to like and hold on to the title variations on Industrial? Why this obsession? Can we say the number US of A. is a kind of protest song versus the current political situation and president? Or what is this song about? Stefan, you roar the lungs out of your body, both on this album and during your live performances, are you really mad at this world, or is all not so bad? Why are you angry? K: When we teamed up, our common favourite bands were bands like Cubanate, Peace Love And Pitbulls, etc … and thus we continued making music in that style. You already have made releases on different labels, how did you end up at Daft Records this time? S: It was actually Dirk Ivens who came to us and asked us if we weren’t recording new songs. Of course we were trying out and recording new things but because of that conversation everything actually gained momentum. 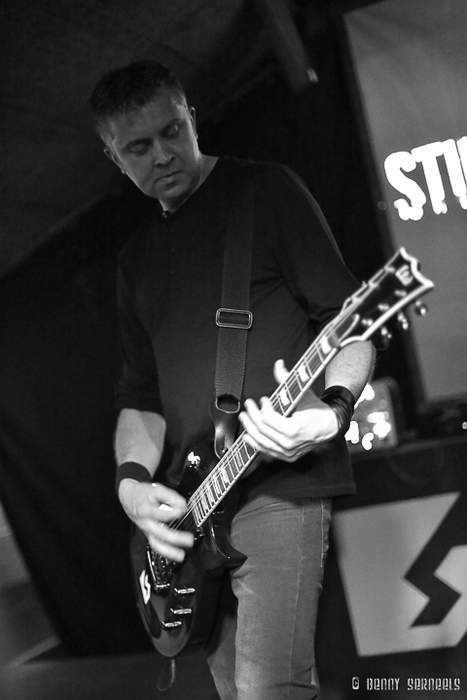 The songs still needed mastering, the lay-out had still to be worked out and we even had to compose a new song in order to deliver a firm full-length album. In the end everything was approved by Dirk and, voila, "Industranquilizer" was unleashed on mankind! K: Honestly, I had never could have thought that Stin Scatzor would ever release an album on DAFT Records; but on the other hand, Dirk has always been around as long as I remember making music. Why did you choose to work through a label again and not to follow the current DIY trend? K: It is also a form of recognition, today everyone can release an home-made album. For a number of releases you've always worked together with the same designer for your artwork? Can you tell us more about him and how you ended up with him? S: If I remember correctly, we got to know User.dx through Johan Van Roy. 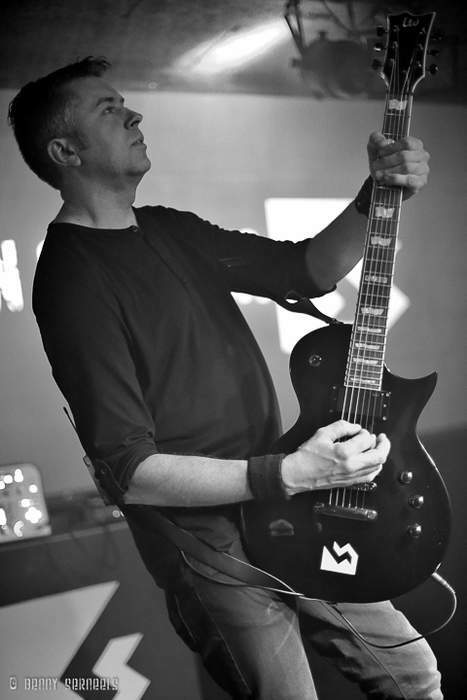 vHe connected us with him, while he also sometimes makes the artwork for Suicide Commando. In the meantime, he already knows very well how we like our layout to look. Despite our 4th collaboration with him, we only met him this year, for the first time, in Leipzig. There is also a cover on this album, Backfire. In contrast to most bands you decided to take a song from the relatively unknown band Animassacre from Bulgaria. How did you get to them and why did you just choose this particular track? S: We once made a remake of that the song for a release of an Animassacre album. Simeon Dotkov even thought our remake was even better than the original. Since we play it occasionally live, we felt that we had to do something with this track. Thanks to Animassacre's permission, we were able to use it for our new album. That one does not get rich of this type of music will not surprise anyone so where do you get the enthusiasm and perseverance to keep this thing going? S: Maybe because for me, it is just like a hobby that gets a little out of control sometimes? It is not an obligation and this makes it all a little more pleasant. I do not have to compose new tracks if I don’t want to, I have no obligations to a label. If we can recover some of the costs we make we are already happy. K: It is also the musical freedom to do what you want, within the limits of Stin Scatzor of course. ☺ Maybe that's why we also have a bit of our own sound. The feedback of the audience to our performances are also predominantly positive, which always gives us the courage and energy to continue. 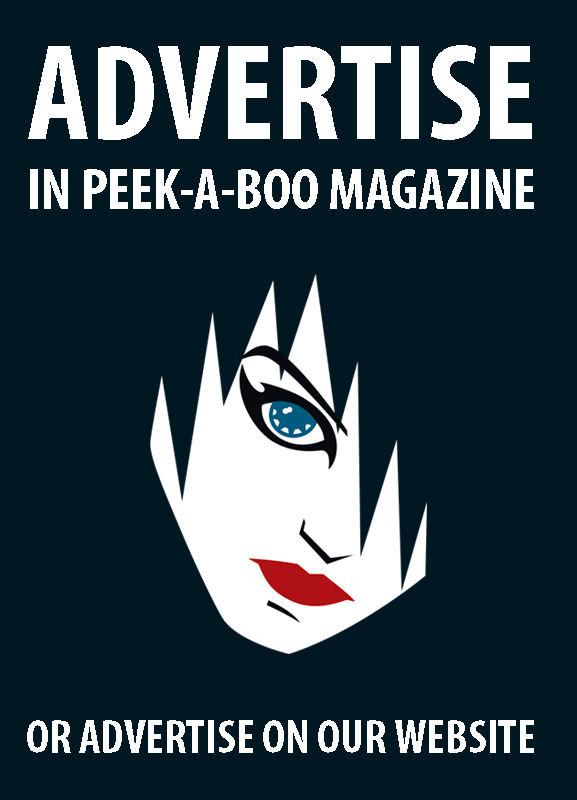 Some prominent artists in the genre, such as Front 242 and The Sisters Of Mercy have recently stated recording a new album is no longer profitable in these times. For example, the recording costs would be too high in relation to the sales figures. What is your opinion about this? K: Of course I can not do the accounting for those groups but I think by occasionally releasing something new, they would please many of their fans. Of course it's also not easy to compete with the nostalgic values ​​of their older songs. What musical dreams would you like to see come true in the future? LACRIMOSA • When I made ‘Testimonium’ I was kind of in trance. DIE FORM • I would like to be optimistic and positive, but the world seems to move inexorably/blindly towards a sombre future, towards chaos. KIM LARSEN (: OF THE WAND AND THE MOON:) • Symbols still carry personal meaning to me. DONDER, HEL & HAGEL • Thunder, Hell & Hail!!! You bunch of fresh water pirates!!! 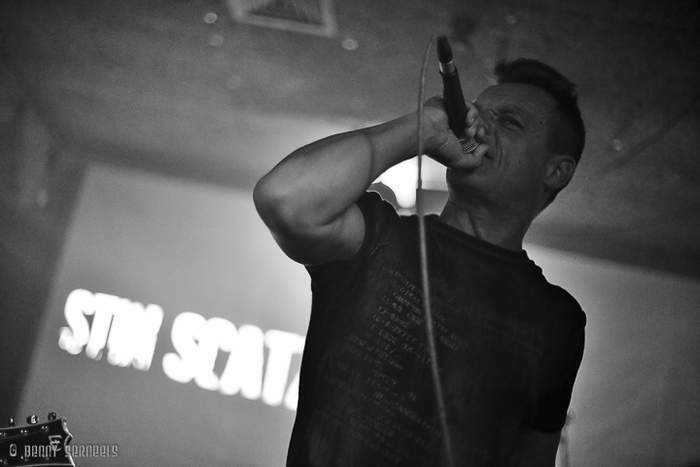 STIN SCATZOR • Our set on Eurorock will be short, but SOLID. STIN SCATZOR • Let's hope it's not going to be the last “resurrection”!! !